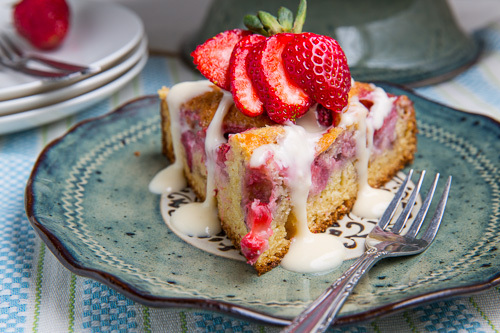 A moist and tender strawberry sour cream coffee cake with a vanilla cream cheese glaze. With the local strawberries in season I have been getting a lot of them every week and it was about time that I used them in a recipe rather than just snacking on them. I have been thinking about a strawberry coffee cake ever since I saw one on Averie Cooks and it was about time that I made one! I went with a pretty basic coffeecake recipe that relies on butter, sour cream and buttermilk to ensure that it is nice and moist and tender both right out of the oven and that it remains that way for a few days. 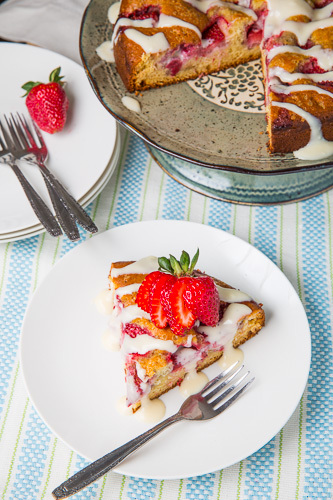 This strawberries and cream coffeecake recipe could not be easier to make; you really just need to mix the dry ingredients, mix the wet ingredients, combine them, pour them into a baking pan and then bake. 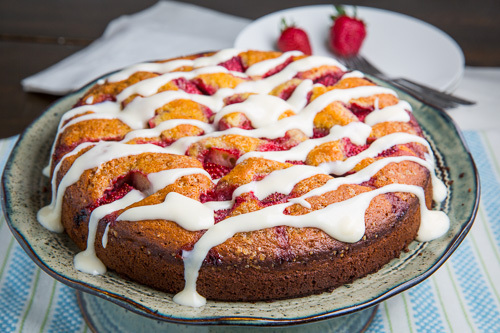 With less than 10 minutes of work you can have this coffeecake in the oven and be impatiently waiting for it to bake while your house fills up with the irresistible aromas of baking strawberries and vanilla! What a great way to enjoy fresh summer strawberries for breakfast! 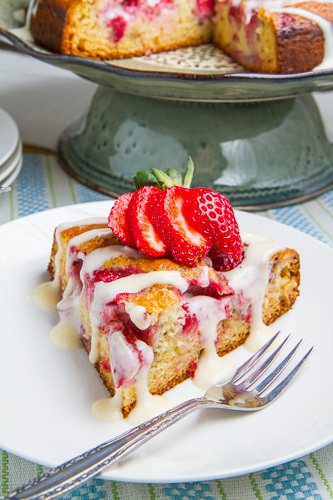 This strawberries and cream coffeecake works well for dessert, snack or breakfast! You have to love that dripping cream cheese frosting/drizzle! This recipe makes 6 servings in a 9 inch spring form pan or an 8 inch square bakin pan. Cream the butter and sugar, mix in the eggs one at a time followed by the sour cream, buttermilk and vanilla. Mix the dry mixture into the wet followed by the strawberries. Pour the mixture into a greased 9 inch spring form pan or an 8 inch square pan and sprinkle on the turbinado sugar. Bake in a preheated 375F/190C oven until a toothpick pushed into the center comes out clean, about 30-40 minutes. 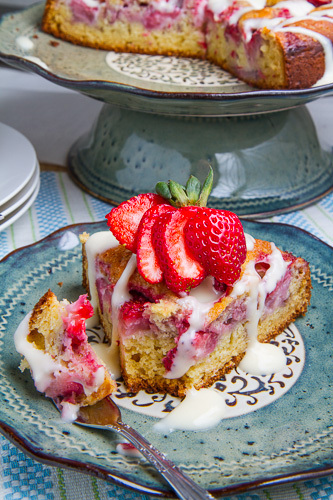 Mix the cream cheese, confectioners sugar, vanilla and milk until smooth and drizzle on cake. Note: You can also use frozen strawberries; just add them to the recipe frozen just like you would with fresh and bake for a few minutes longer. So decadent … and so good! Thanks for posting the recipe. This sounds absolutely perfect! What an awesome recipe Kevin! A delicious looking cake! Very tempting. Kevin, this looks amazing! Strawberries and cream is such an amazing combo! How can I get that delivered in the next hour? What a beauty this cake turned out to be! I assume you used the same cream cheese glaze as the link you referenced since you didn't post the directions on how to make it here. At least I can't seem to find them. I have looked and looked, but I don't see the directions for the cream cheese glaze. Help! Kevin I love this look ABSOLUTELY AMAZING!!! Savannagal & Mary Lou C: Sorry about that! I missed the last line of instructions there! I have added it! Desiree Greco: Turbinado sugar is a brown sugar with really big granules that adds a nice crunch to this coffeecake when sprinkled on top. I'm on love with this cake. It is just so beautiful and looks incredible! going to make this tonight cant wait! for the record anything ive ever made from kevin is amazing, that bacon jam OMG what a treat. i once added it to a spinach and leek tart what a hit that was.. i also added a tbs of it to the tart dough for added flavor was amazing, got the idea from when you add cheddar to pie dough for apple pie same idea. what a gorgeous cake! I love that you added cream cheese glaze to it…that makes anything even better. Beautiful job! Averies baked treats always look so fantastic, and you did a wonderful job. Thanks for linking up to my cake, Kevin! I saw your post on FG and thought, wow, that looks like my recipe!!! And then I clicked over, and sure enough, you linked to me. Thanks! Your cake looks incredible. I love my version of the cake when I made it and yours looks stunning. Soft, fluffy, and plenty of glorious, drippy icing! Wow, that looks so delicious and I really love foods which contain strawberries. Beautiful cake and cake stand! Bet it tastes great! Such a pretty cake! It would be perfect to serve at brunch. Local strawberries are the best – nothing like store bought. Do you drizzle the frosting when the cake is hot or cooled? Anonymous: I let it cool a bit but there is no need to wait for it to be completely cooled. I loved this cake so much I made it 2 days in a row!!! Can yogurt be used instead of sour cream? Rania Alali: Yes, you can use yogurt in place of the sour cream! Enjoy!